51 Uses for Coca-Cola – the Ultimate List | mizzeliz – working for you.. I was trawling the Internet recently searching for a way to remove a grease spot from a favorite shirt of mine. How it got there, well, I blame a faulty fork and not my clumsy mouth. Anyway, time and again sites would reference a can of Coca-Cola as a way to remove the grease spot. I tried it, cynical but hopeful, and it worked. Not 100%, but it was way better than before. It did leave me wondering, are there other uses for Coca-Cola? It turns out there are a lot more. I haven’t had a chance to test all of these out, but the ones I have listed here are the uses I found turning up time and again; not just on the web, but in books and magazines. If you have any more, feel free to share. And by the way, I’m no Coca-Cola advocate, I’m sure Pepsi or even store-brand would work just as well (unless that secret Coke ingredient is behind all of this…but I doubt it). 2. Remove rust; methods include using fabric dipped in Coke, a sponge or even aluminum foil. 3. Remove blood stains from clothing and fabric. 4. Make gooey Coke funnel cakes . 5. Clean oil stains from a garage floor; let the stain soak, hose off. 6. Loosen a rusty bolt; pour on some Coke and wait for the magic to happen. 7. Kill slugs and snails; a small bowl of Coke will attract them, the acid will kill them. 9. Prevent an asthma attack! Apparently, the caffeine in two 12oz cans can prevent the onset of an attack. 11. Clean burnt pans; let the pan soak in the Coke, then rinse. 12. Descale a kettle using the same method in 11. 13. Neutralize a jellyfish sting. 14. Clean car battery terminals by pouring a small amount of Coke over each one. 15. Cure nausea; let a can of Coke go flat then take a teaspoon of Coke every hour. 17. Make a Mentos & Coke exploding fountain. This one takes a 2-liter bottle of Coke. 18. Get rid of hiccups; gargle with a big mouthful of ice-cold Coke. 19. Shake up a can and pour it over your windshield to remove bugs and other crud. 20. Use the method in 19 for your car bumpers, too. 21. Clean your engine; Coke distributors have been using this technique for decades. 22. Relieve congestion; boil and a can of Coke and drink while hot to clear you up. 23. Make a sweet BBQ sauce. Mix a can of Coke with ketchup and brush over ribs or chicken. 24. Baste a ham roast with Coke as it cooks. The sugars will caramelize; the ham will be moist. 25. Add a can of coke to your pot roast to tenderize it and add extra flavor. (Thanks Linsey). 26. Make pretty pennies; soaking old pennies in Coke will remove the tarnish. 27. Make your hair curly; pour flat Coke onto long hair, leave for a few minutes then rinse. 28. Age documents and photos; for that antique look, apply Coke, pat with paper, leave to dry. 29. Clean tile grout; pour onto kitchen floor, leave for a few minutes, wipe up. 30. Mix a can of Coke with a packet of Italian seasoning; cook a tough steak in it. 31. Make better compost; Coke increases the acidity, adds sugars and feeds microorganisms. 32. Dissolve a tooth in it; Use a sealed container, this takes ages. Why would you want to though, unless you’re Hannibal Lecter? 33. Remove gum from hair; dip into a small bowl of Coke, leave a few minutes. Gum will wipe off. 34. Get silky skin; mix a spoonful of Coke with regular lotion and apply liberally. 35. Make low-fat brownies . 36. Pour a little in a cup and set it out an hour before a picnic, away from your site; it will attract wasps and bees so they’re not bugging you and your grub. 37. Remove stains from vitreous china. More info on vitreous materials here . 38. Got a dirty pool? 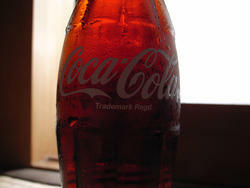 Add two 2-liter bottles of Coke to clear up the water (it acts as rust remover). 39. Add Coke to your laundry to remove bad smells, especially fish. 40. Remove (or fade) dye from hair by pouring diet Coke over it. 41. Mop a floor with Coke to make it sticky. It’s a movie industry trick to stop actors slipping. 42. Remove marker stains from carpet. Apply Coke, scrub, then clean with soapy water. 43. Clean a toilet; pour around bowl, leave for a while, flush clean. 44. Apply to skin for a deep tan (although this seems like a recipe for skin cancer to me). 45. Supposedly, drinking an 8oz can of Coke every day can prevent kidney stones. 47. Perk up your Azaleas or Gardenias. 48. Coke and aluminum foil will bring Chrome to a high shine. 50. Add it to vodka, rum or bourbon. Coke is not used by the authorities to clean blood from the roads after accidents. Coke will not dissolve teeth or nails OVERNIGHT. It takes a long time. So, that’s what my days of research turned up (yes, days. Anyone who tells me to get a life will be justified). If you have anything to add, pour away folks.